I woke up ready packed for my move across the city. Disappointed to have missed Amanda I went and had breakfast. Her head appearing round the corner we sat and chatted for hours. On the same page, it was nice to connect. Making plans to visit the last night market at Victoria market until November, she headed off to a job interview. Carting my backpack, which incidentally is nearly the same size as me, off on the number 57 tram, I reached my hostel. Accessing it through a bar I was more than a little sceptical I was in the right place…! Checked in, it was evident it was very much a party hostel. 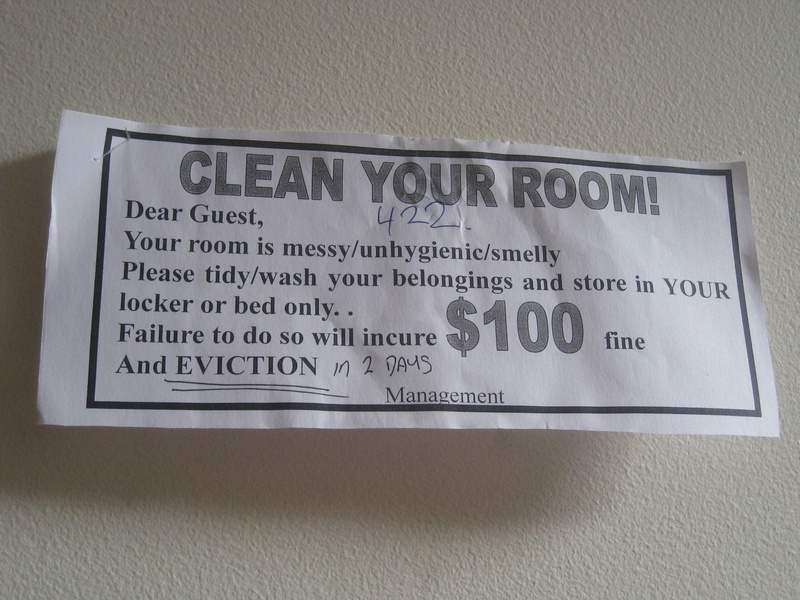 On getting to my room, met with the dirtiest room i’ve slept in so far, the first words my roommate uttered were “we’ve had a hygiene warning for our room as it is so dirty.” Looking at the note, it was apparent that they were going to be evicted if they did not clean it…! I took this moment to escape, all valuables in hand, and grab some free wifi at Federation Square. The man next to me, cracking his knuckles like nobody’s business told me I looked German! That’s novel! It beginning to rain (4 seasons in one day is so apt for Melbourne!) I had to venture back for a jumper! Making evening plans with Ali and Ben, the boys from Adelaide, I attempted to upload some pictures. The connection slow, I had to give up! A facebook friend request from a korean friend, i was reminded of my first week in Melbourne. The boys picking me up en route to happy hour, they informed me they were unhappy with being called ‘englishmen’ in my previous blog post! The handsome, strapping, young men that they are, I will ensure that any future instances are noted by name! Met by a happy hour board with the word ‘snakebits’ (I can only assume they mean snakebite or that is an entirely different drink), for $6 I thought why not . Reminding me of my Murano St days, Ben and Shane, an Irish boy who had joined us, signed me and Ali up as the table’s beer pong team! Not having played this in 10 years, it certainly served as a reminder of my uni days! Whilst pretty good, and down to one cup apiece we were beaten. A commendable attempt, it was probably just as well we lost! Realising I had forgotten to pick up my remaining food from the hostel, I am more than a little gutted that there is a pack of timtams, penguin like biscuits for those who haven’t had the pleasure, and a new bag of $7 almonds in it… Having been in my bag but removed as it was so heavy, once again it was a reminder to always go with your instincts…! Having a fab evening with the boys, it is a shame they are heading to New Zealand on Sunday. Returning to the hostel, met with the smell of hash in the hall, never thinking i would say it, I miss YHA! In bed, apparently pillowless, it is a bit late to be going looking for one now! Always looking for the positive, at least I am only here for one night!